'Many people have asked the Dalai Lama to address the current difficulties facing humanity. In these talks given in London, he speaks about a wide range of issues including Bosnia, racial hatred, gender and environmental protection. Modern life is so full of confusion and suffering that people need the courage to face their anger and hatred in order to transform their lives and relationships. I bought this book at a place where it ought to be bought, a calm Buddhist temple as I've a habit of taking books as souvenirs to conclude my trip. Anyway, the Dalai Lama is one of the spiritual leaders whom I respect despite my own personal views on the subject; for his relentless struggle towards the Tibetan cause and more importantly, for being one of the more forward thinking people in his field and in this very book, he asserted that one can't reach too far in the path the enlightenment by means of blind faith, contrary to what I have heard from many in the same field. 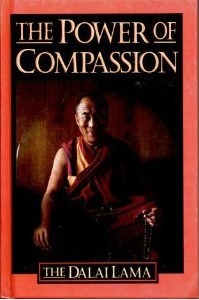 This book is a collection of lectures, on how to show compassion, how to accept death gracefully, among other similar topics and the last part of the book is a Q&A session documented. To be very honest, I really wanted to like the book, but then, I was far from impressed with this book and in fact, I found his delivery to be rather dull. Moreover, this book cannot be read by someone who is not acquainted with Buddhist practices and philosophies, although I am not completely in the dark with regard to the same considering a lot of similarities with the religion I was raised in (being Hinduism, though, I quit religion long ago) but then, there were several instances where I was totally lost. I do appreciate that he tried to appeal to people like myself, adding a caveat after any reference to re-birth or other related religious concepts that 'even for non-believers...' but then, those arguments proposed weren't totally convincing. Moreover, I guess my scepticism is also owing to my complete ideological differences with one of the strongest concepts that he was riding on, throughout the lecture, as to not show attachment but show compassion. While I agree with the latter part, I believe it is inherent human nature to show attachment to people whom you regard and love while you could still be compassionate towards the society at large and no convincing arguments were made as to how these two are mutually exclusive and moreover, I am of the very strong belief that a state of trance reached through detachment and giving up on desires is merely an illusionary happiness and I for one would prefer to be sad in the real world than exercising that option. I don't know if he was just trying to be funny which I doubt considering the otherwise serious nature of his lecture, he has narrowed down an entire subject to ONE school of thought, being positive economics and as per his view, I guess Alfred Marshall was fine with money making through drugs; I mean, going by Voltaire, I do defend his right to believe in that idea and defend his right to profess that in a speech (and it'd apply for my thoughts on philosophy too) but then, nevertheless, this was a ridiculous remark to make and from that moment on, I stopped taking the contents of this book very seriously. This could seriously be a case of a right book landing in the wrong hands and I still feel this could be enjoyed by those who wish to understand and learn about Buddhist philosophies but then, the review being typed by the same hands that held the right book, the review is inevitably going to be bad, and thus, my rating for the book shall be a four on ten.